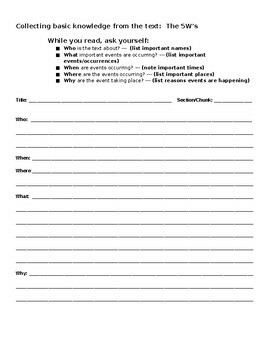 This is a very useful note taking organizer for helping students close read a text. 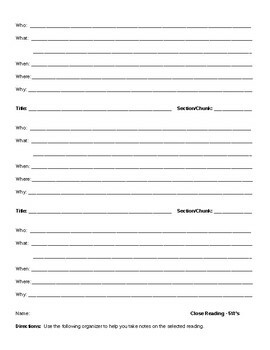 This organizer provides multiple spaces for students to take notes on the "Who, What, When, Where, and Why" of the text they are reading. 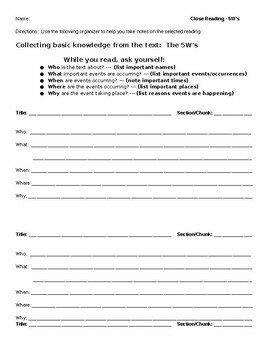 This is particularly useful for students who struggle reading with a purpose and organizing their ideas into useful comprehension notes. This handout is easy to manipulate and can be used with any fiction or non-fiction text.